On Monday night, Dec. 5, Moscow saw the biggest protest against Vladimir Putin since he rose to power 12 years ago. Between 5,000 and 7,000 people showed up, packing a square in the center of the capital, hanging from lampposts in the rain, blocking traffic on surrounding streets and chanting for Putin's arrest. They were furious at the elections this past weekend that let his party hang on to its majority in parliament, and unlike the much smaller protests Moscow sees from time to time, this one was not populated by communist grannies or flare-waving nationalists. This was Russia's Internet generation, the yuppies and the college students, whose anger has finally spilled from the blogosphere onto the streets of the capital. It did not come from out of nowhere. Ripples of frustration ahead of the elections had been suggesting a political sea change for months. At least since Putin announced in late September that he would return for a third term as President next year, his approval ratings have slipped dramatically, spawning a wave of online parodies of him as an aging autocrat. In November, that frustration saw its first mass expression, when he was openly booed by a stadium of fans at a mixed-martial-arts event. The ratings of his United Russia party have meanwhile gone into free fall, and on Sunday, Dec. 4, when Russians went to the polls to elect a new parliament, United Russia lost a quarter of its seats and failed to get even half of the popular vote. Allegations of massive voter fraud, widely reported by observers and the opposition, were among the reasons for Monday's protest. But they made up a small portion of the grievances chanted in the square (and, for that matter, in simultaneous demonstrations in St. Petersburg, Putin's hometown). To understand the wider animosity toward Putin's rule as well as the reason so many people showed up, it helps to look at a middle-class Moscow suburb about 50 km (30 miles) east of the capital. It is a typically dingy place that has seen typically little in the way of public works since United Russia took power there a few years ago. The locals complain endlessly of corruption in the town government, but there were never any public outbursts of dissent until around midnight on Thursday, a few days ahead of the elections, when two men cut through a padlock, scrambled onto the roof of an apartment tower and hung a giant banner off the side of it. That had never happened there before. In letters more than a meter tall, the banner sardonically told the locals to "Vote for the Party of Crooks and Thieves." Virtually every Russian would understand this as a reference to United Russia party, which has struggled to shake the nickname since it was coined a year ago by anticorruption blogger Alexei Navalny. In a wink at the local bureaucrats, the men who hung the banner signed it with the words, "Sincerely, Your Alcoholic Mayor." The most striking thing about the vandals was not their wit but the fact that neither of them had ever belonged to any political parties or movements. Both of them are average family men in their early 30s  one an IT engineer, another a local business owner  and they weren't even politically active until this election cycle. "I guess I just got tired of whining about Putin on my blog," says Sergei, 31, the IT engineer. "I felt like I had to actually do something, something real." (The two asked TIME not to print their real names, for fear they would be prosecuted; TIME chose not to print the name of their town.) By Saturday night, the eve of the elections, their banner had been removed; instead of paying $400 to reprint it, they went around posting flyers critical of United Russia on all the local apartment blocks. In the context of Russia's docile political culture, the sight seemed bizarre: two full-grown men, risking arrest and humiliation, scampering about in the middle of the night to fulfill some abstract political urge. But one of the flyers helped explain. It showed a picture of an infant above the following caption: "One day, your child will ask you, Papa, what were you doing when the crooks and thieves were robbing our country blind?" The flyers were not their handiwork; they had been printed from a Russian website called RosAgit, a kind of free design studio for antigovernment propaganda, and one of many new sites to spring up from Navalny's peculiar brand of Internet activism. Most of his online projects have the same basic mission  to empower Russia's enormous community of Internet users to engage in real-world activism. One of them, perhaps the most clever, was the site RosYama, which is short for "Russian pothole." It tries to channel a common frustration  the dismal state of Russia's roads  by inviting users to post pictures of potholes and log their location on a map. The site then automatically generates an official complaint to the local traffic police, who are legally obligated to respond. If they fail to do so, the site generates a complaint against the police to the prosecutor. The idea is not just to overload Russia's creaking bureaucracy but also to get people to take that step from griping to action. "I don't agree with everything Navalny does," says Alexander, 30, the business owner who posted the banner. "But he has sort of shown us the way." And Navalny's audience is growing. As of November 2011, Russia has more Internet users than any other country in Europe, and the country's blogosphere, with about 5 million blogs and 30 million monthly readers, has become the last truly free space for political discourse in Russia's tightly controlled media. As it became clear on Monday, it has also shaped a generation that is as disaffected as it is politically aware. "So this is what they look like," said Oleg Orlov, an old Soviet dissident and the head of Russia's leading human-rights organization, when I ran into him at the protest. "I've never seem them at rallies before, at least not in such enormous numbers. It's incredible," he said. From the stage erected on the square, the activists tried to focus on that new phenomenon. "The revolution is not made, and the constitution is not defended, on Facebook and Twitter," said Roman Dobrokhotov, a political activist and blogger. "It is made here on the streets." In response, the crowd began cheering, "Russia without Putin!" But the obvious hero of Monday's protest was Navalny. Through his hugely popular blog, he had called on many of his fans to attend, and when he took the microphone, he had a simple message for the hipster demographic. "They can laugh and call us microbloggers," he said. "They can call us the hamsters of the Internet. Fine. I am an Internet hamster ... But I know they are afraid of us." The riot police did look afraid. It was one of the few times in recent memory when they were faced with a crowd too large for them to fully control. 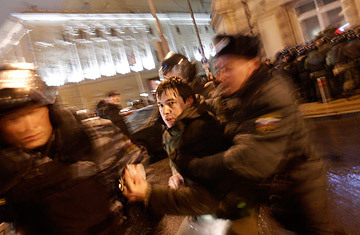 As the rally ended, the crowd surged toward them, attempting to march on the Kremlin, and the police were forced to use their truncheons to push them back. About 300 protesters were arrested. As the rest dispersed, I found Alexander, who had driven down from his suburban home to attend. Beaming and chain-smoking cigarettes, he told me the election results in his hometown had given United Russia a mere 17%, half as much as the Communist Party. Careful not to sound presumptuous, he added, "Maybe it had to do with our banner. I don't know. But it's our little victory." Then he looked back toward the crowd and asked, "Did you see where Navalny went?" By then, he had also been arrested. Who should be TIME's Person of the Year 2011? Vote for your choice here.